Sclerotinia stem rot is a fungal disease of canola, that can cause significant yield losses exceeding 20% under conducive conditions. Initially only common in parts of the northern wheatbelt, it is now a challenge in other areas of Western Australia's wheat belt. It is one of the most variable and unpredictable diseases of canola but incidence of infection varies greatly between paddocks and between years. Yield losses can be severe in years of higher moisture, cool conditions and high humidity which favour disease development. Sclerotinia can infect any part of the plant. 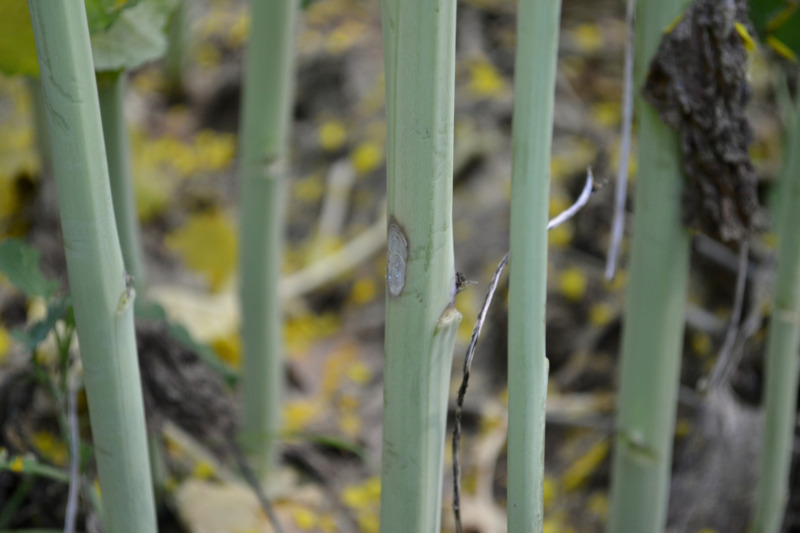 Symptoms appear as bleached greyish white, or brownish white, fungal growth covering portions of the canola stem sometimes just above soil level but also at any height in the canopy. After infection is well established, the disease causes plants to wilt and ripen prematurely, resulting in lodging and reduced seed production. Advanced infection will have sclerotia (hard, black, generally irregular-shaped to rounded bodies) growing on the inside of the affected and bleached parts of the stem. 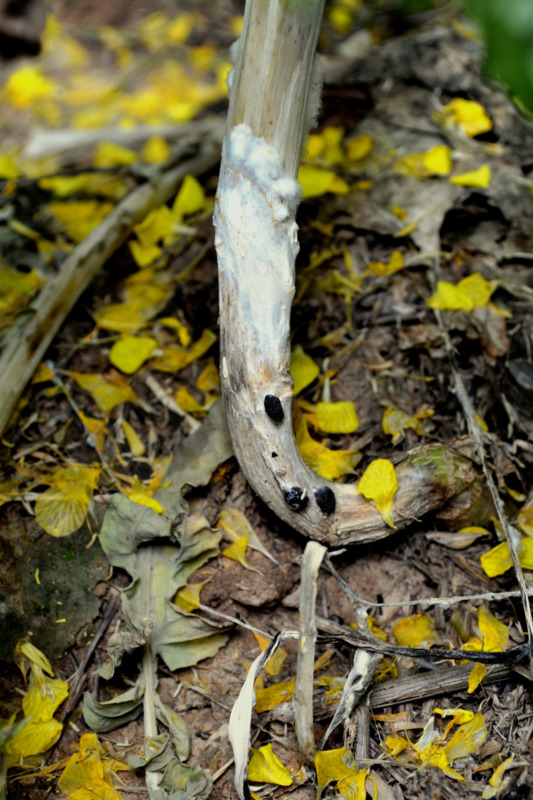 Bleached stems can be carefully split to observe the black sclerotia within. The sclerotia, which are larger than 2 millimetres (mm) in diameter, are the survival structure of the fungus. They appear like rat droppings. In moist weather they can also form on the outside of the infected stem or roots. If the weather is favourable, canola pods also may become infected. Infected pods appear creamish white in colour and usually contain white mouldy seeds. In some instances, these seeds are replaced by sclerotia which contaminate harvested seed samples. 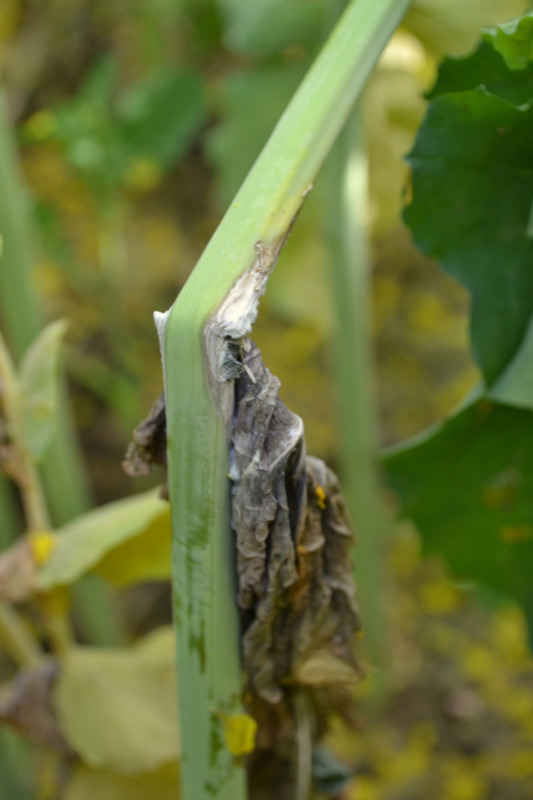 Further information on diagnosis is available on the MyCrop sclerotinia page and you can submit samples for definitive diagnosis to DDLS - Plant pathology services (this is a chargeable service). For disease to occur, sclerotia or spores must be present to initiate infection. Sclerotinia sclerotia can survive for six years or more in the soil, so the disease risk persists for several years. Sclerotinia spores can blow in on the wind from neighbouring paddocks that previously had the disease. Sclerotinia has been present within the past three years in the paddock or an adjacent paddock. An intensive rotation with other broad-leaf crop species has been followed. For example, if a canola or susceptible crop has been grown in the past two years, then the risk is high compared with a paddock where only cereals have been grown for the past five years. 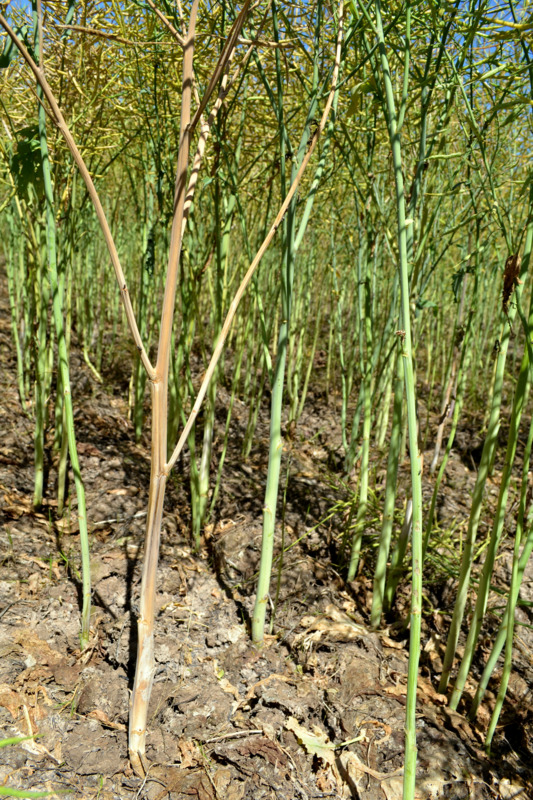 The over-riding determinant of the severity of sclerotinia stem rot that develops in a crop is the weather during flowering on the primary stem. Moisture in the crop canopy is required for infection to occur and develop into stem rot. This usually results from frequent rain events of 5mm or more. Infrequent rain or light showers are unlikely to result in sufficient canopy wetness for yield-limiting infections to occur. 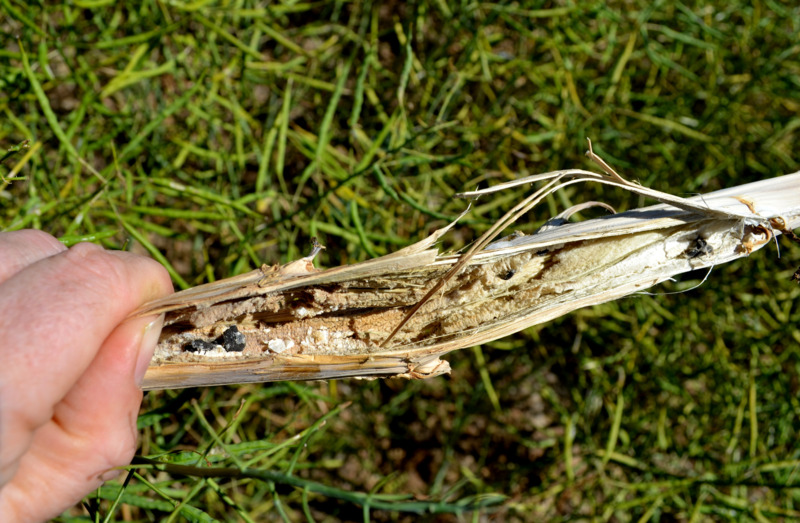 Sclerotinia stem rot is caused by the fungus Sclerotinia sclerotiorum. It survives as sclerotia in the soil for many years. The fungus may also survive by colonising other host broadleaf plants such as lupins, chickpeas, lentils, faba beans and field peas, and weeds such as wild radish and capeweed. During cool (10-22ºC), moist weather in autumn or winter, sclerotia in the soil (fruiting bodies that look like rat droppings) germinate and produce small, cream, mushroom-like bodies called apothecia. These grow to be about 5mm in diametre and become darker coloured as they age. These apothecia produce large numbers of ascospores, which become airborne and blow to nearby crop plants. While the spores rarely infect healthy stems and leaves directly, they readily infect canola petals (illustrated below). When infected petals fall into the canopy and stick to leaf axils, the fungus invades healthy leaves and stems using the infected petal as a food source. Cool, wet weather favours the pathogen, and mist, dew and fog provide enough moisture for infection. Under extremely moist conditions, Sclerotia resting in the soil can also germinate to produce hyphae or mycelium that can penetrate the stem base of a nearby canola plant and cause basal stem infection. Direct germination of sclerotia is not considered to be a common cause of infection in canola, but was observed in WA in 2016. To keep up to date with sclerotinia reports from across the wheatbelt subscribe to PestFax. If you find apothecia or sclerotinia in your crop please report your find to PestFax reporter to let other growers know, or the PestFax editor via PestFax@dpird.wa.gov.au. Sclerotinia sclerotiorum has a wide host range including more than 400 different plant species. It infects most of the broad-leafed crops. Among these, lupins and chickpeas are commonly infected whereas faba beans and field peas appear to be less susceptible. Broad-leafed weeds, such as wild radish and capeweed are also hosts and play a role in carryover of the fungus.